This dog lives on the way to my japanese lesson. It's quite young, and very friendly. When I came by today, there was a beginning thunderstorm, and the dog was trembling with fear, pacing all the time back and forth in the rain, in the hope of getting away from the thunder. While I was talking to him and fondling him, he stopped and calmed down a little - only to run around quicker when I left. 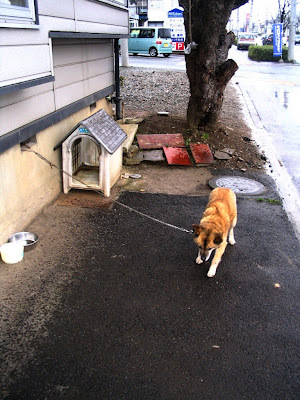 On January 1, 2007, California became first state in the nation to pass a law to limit the chaining and tethering of dogs. SB 1578, otherwise known as the tethering law, makes it illegal to tether, fasten, chain, tie or restrain a dog to a doghouse, tree fence or any other stationary object for more than three hours in a 24-hour period. This law works in conjunction with California Penal Code section 597t which states that confined animals must have access to food, water and shelter. Poor doggy. If it allows to touch it, then it have not been on chain for long time. @ Roberto: Lucky californian dogs! @ mountaincat: It is - at least for the last two years. But most chained dogs around here are still very friendly, even if they have been chained all their life, and very hungry for the slightest attention.